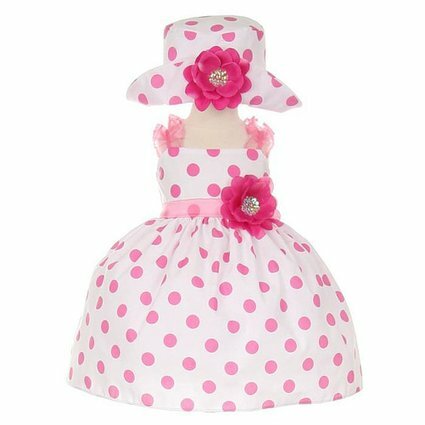 Dress up your precious baby girl in this cute polka-dot dress! A fun addition to her wardrobe, this dress features playful ruffled shoulder straps and a sewn-on organza sash with a beautiful sequined flower accent. The bodice and skirt are both accented with polka dots for an extra-fun look and feel. A matching bucket hat completes the outfit and is great for the summertime to shade your little girl's eyes from the sun while looking stylish!